Hue imperial city by day is peacefully beautiful and tranquil with ancient complex structures and natural sights. 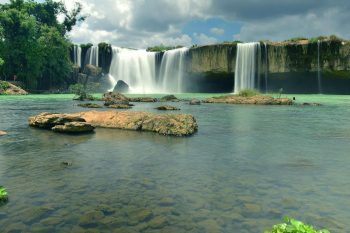 The Hue nightlife is a little more active and colorful with various activities to enjoy, yet the city still has its charming, gentling. 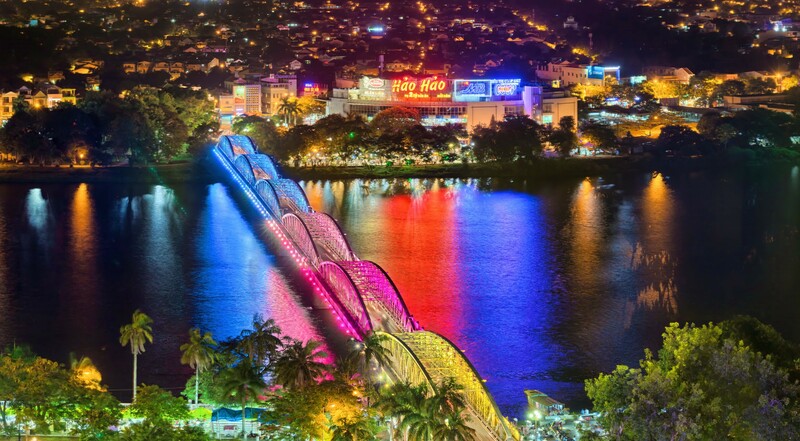 The iconic scene of Hue by night is the Trang Tien bridge which colors the peaceful Perfume River (locally called Hương River). Starting your little Hue travel with finding some local food is a delicious idea. Here are some suggestions for your food tour on the riverbanks. 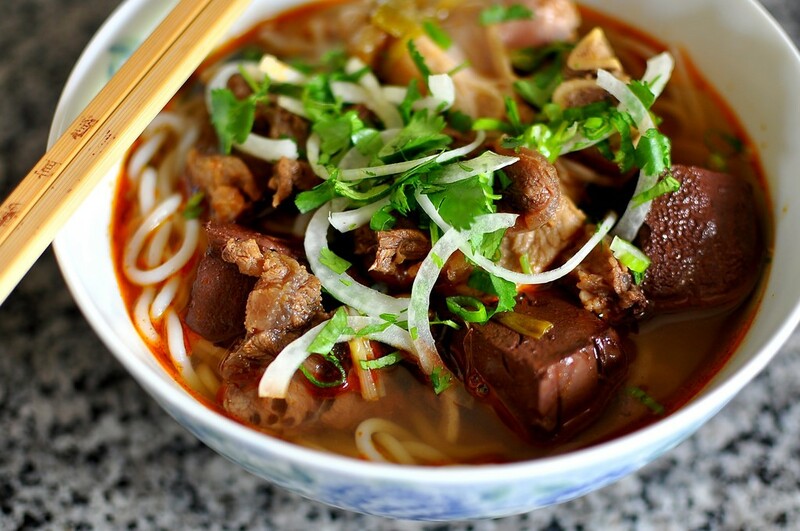 Tourists can start with the mouthwatering Bún Bò Huế (Spicy beef thick-noodle soup), the second most popular cuisine in the country after Pho (Beef flat-noodle). 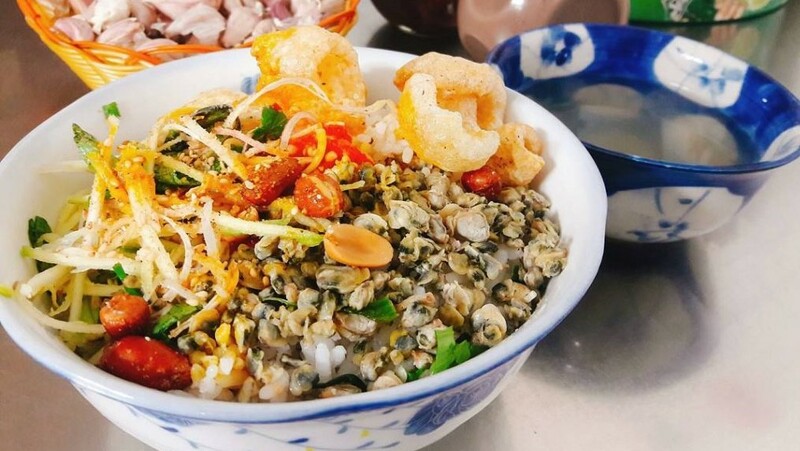 Travelers can find this dish almost anywhere in the country, yet the special flavor in Hue is the original one. The second recommended dish to try in Hue is the Hue Mussel Rice (Cơm Hến as the local call). 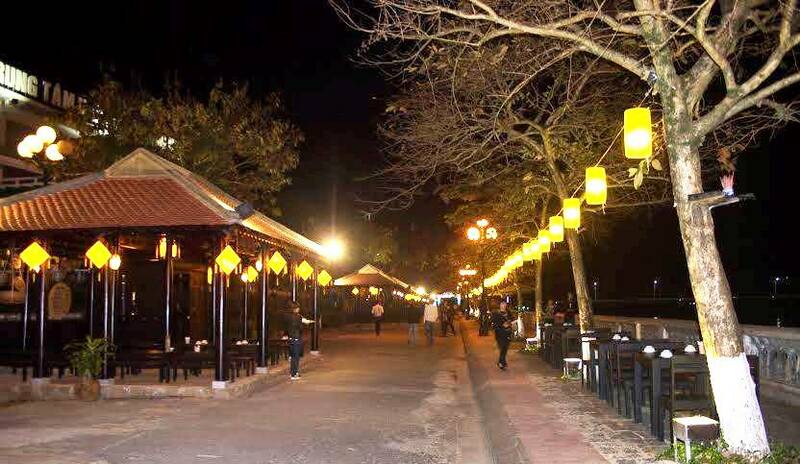 After having the early dinner, you can enjoy walking along the river, enjoy your Hue sightseeing by night on the Nguyen Dinh Chieu Walking Street (Phố đi bộ Nguyễn Đình Chiểu, as the local call). Sweet soups and tasty cakes made from rice and rice flour are on the way, you can stop at a local street food stall or find an affordable eateries or restaurants for your light-and-late-dinner. A tip for your better night market tour is bringing a local friend or finding a local guide to go with you for bargaining when shopping here. 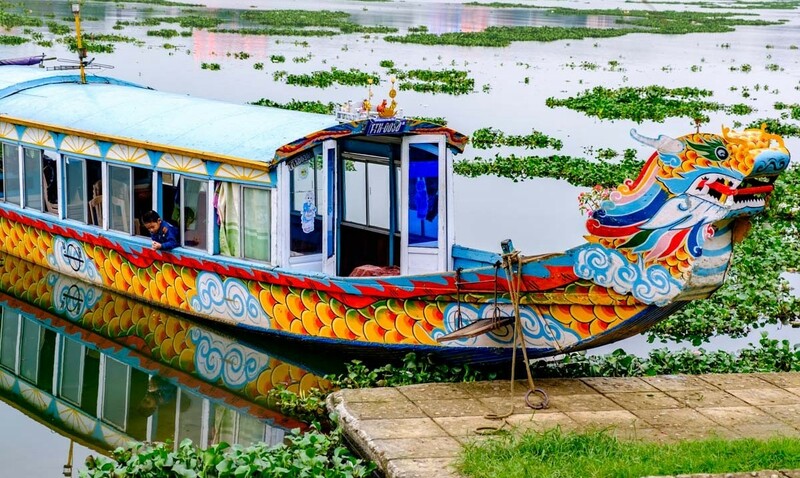 During your night in Hue, you could join a dragon boat tour (which is the royal means of transportation in the ancient time) and enjoy the live Hue folk song performances right on the boat. Find your ways to the Tòa Khâm Pier and buy ticket(s), around 7 USD (about 150,000 VND) for a ticket, and estimated travel time on river is 1 hour and 20 minutes. If you want to sightsee the riversides in the morning, the tour is available from 8 AM, until 11PM. 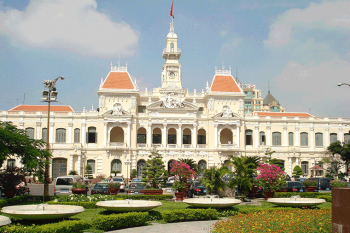 Another significant destination to join in the night is the Hue Royal show, located on the Le Loi Street, between the Tràng Tiền Bridge and Phú Xuân Bridge, near the Nguyen Dinh Chieu walking street. The Royal Show or Ao Dai Show opens every night with two time slots: 5.30PM and 8PM, with the ticket price around 210,000 VND (around 10 USD) for a King Ticket (including beers, soft drinks and cakes). 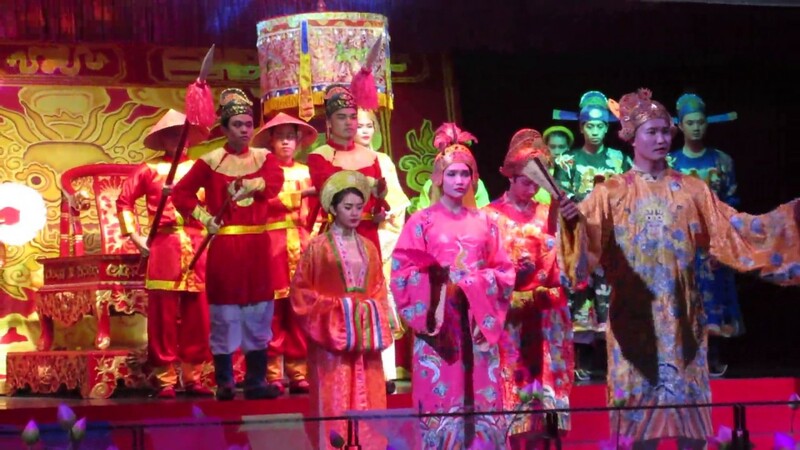 The show is composed of 5 parts with spectacular cultural and imperial performances emphasizing the beauty of traditional Ao Dai and ancient cultural arts. 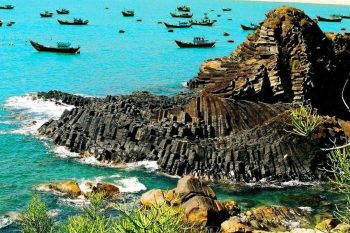 What if travelers are tired of Hue Vietnam sightseeing? 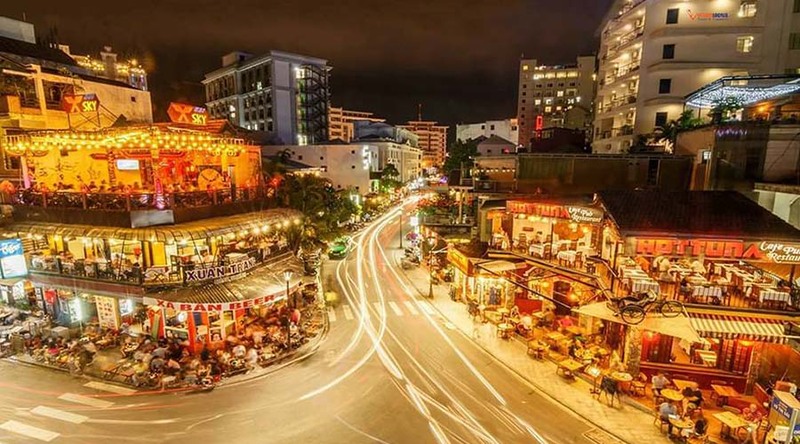 The Hue City still has fabulous modern night activities, with dozens of bar clubs and pubs if tourists are looking for some places ‘Western’. Pham Ngu Lao street in Hue is popular for foreigners, like the Tạ Hiện street in Hà Nội and Bùi Viện street in Saigon. No matter how modern and developing the city is, people just have images of a Hue old town with historical value and heritage-recognized activities. If you have ever been to Hue, feel free to share your stories with us, Saigon Riders. We are more than willing to listen to your experience. 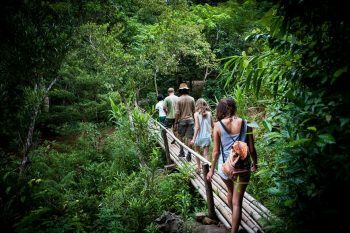 And if you are looking for a companion during your trip, we are always ready to give you up-to-date suggestions.